We are going to show you how to set up table rate shipping. In this example we are going assume the store ships their products to the USA and Canada – the plugin supports every country that WooCommerce supports, but we’ll use these two as examples. You can also use zip/postal codes, states and regions. If you are unfamiliar with Shipping Zones, check out our WooCommerce Shipping Zones Tutorial. Before setting up your shipping rules, it is really important that you define exactly what they are. The plugin is only as good as the rules you define! As you can see we are shipping to the USA & Canada. For the USA we will have 2 shipping methods: Standard and Express Shipping. For Canada just Standard. In this example we will be using the total cart value as the trigger for the ranges. So for example, if I had a cart with total value of $45, it would cost $7 to ship Standard in the USA and $10 to ship express. 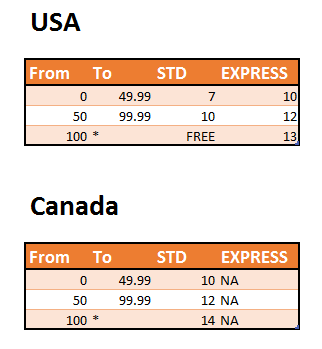 In Canada the same cart would cost $10 to ship Standard – there is no Express option for Canada. Here is the video – take a look at just how easily and quickly you can have WooCommerce set up and ready to go!